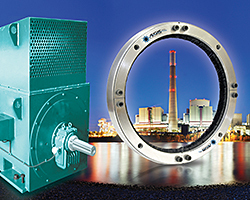 The AEGIS iPRO Bearing Protection Ring channels electrical currents away from bearings to ground. It is designed for high-current applications and can accommodate generator/motor shafts up to 30 inches in diameter. The split-ring comes in mating halves to simplify installation around the shafts of coupled equipment.